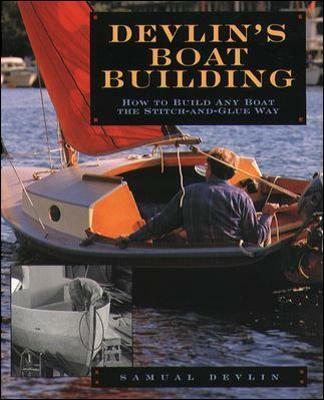 Sliding Hatch Construction on Wooden Boats. 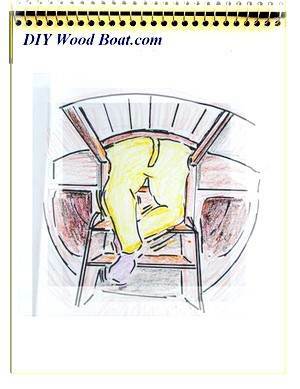 The Sliding Hatch has become ubiquitous as the main-hatch cover on many boats. Its popularity is due to its practicality, ease of use and the efficient use of space which, is particularly welcome on small boats. 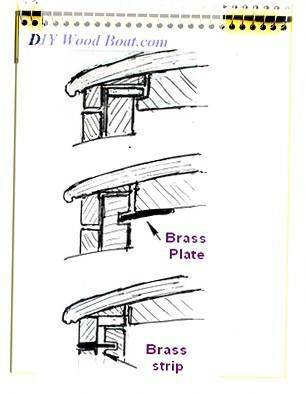 If you are planning to build your own there are a number of criteria which the hatch should attempt to address. It wants to be leak proof as possible. Lockable, to keep out the thieves. Good to look at so as not to spoil the overall look of your boat. It should be strong enough to be walked on. It should slide open easily without jamming. As maintenance free as possible. Below aresome ideas for building your own sliding hatch. If you are replacing an old sliding hatch then the size may very well be preordained. However, if you are building from scratch then you are free to design your hatch to suit your requirements. The larger the opening the easier it will be to enter and exit and the more easy it will be to stow bulky gear below. But the larger the span the stronger the hatch is going to have to be, especially if it is likely to be walked on. And the larger the hatch the heavier it is going to be. The minimum size to allow for normal ease of access needs to be 24inch/ 610mm square but preferably with at least one of the dimensions longer. It is virtually imposable to make any sliding hatch completely waterproof, especially when there is driving rain, spray and even green water washing over the decks. However, you can go a long way towards eliminating drips by judicious use of rubber drip seal. A double cross beam at the forward end of the rail framework will trap much of any water blowing from ahead and a couple of scuppers will allow it to drain away. The hatch should be built from a stable hardwood which won’t swell and contract too much when whetted and dried in the sun. There are numerous ways in which your hatch can be made to slide. While wood sliding against wood will work reasonably well, as long as the running surfaces are well waxed or greased, this sort of arrangement will tend to stick when wet. Your hatch will slide more easily and consistently if at least one of the running faces is metal. Brass is the preferred metal for slide runners, stainless steel could be used but brass looks better on a wooden boat, bronze would look even better but is more expensive. On Mignonne I was able to use some old sail track for the runners, this had the added benefit of being pre-drilled for the fixing screws. The runners should be about twice the length of the hatch opening. The rails must be parallel and perfectly straight along their entire length. When making the rails they must be chamfered to fit the cabin top so that they are not distorted when they are fastened down. The hatch in the drawing has a brass strip running in a wooden groove, however the hatch will slide more easily if you design it with metal running on metal. On the other hand you don’t want it running too freely or it will be sliding backwards and forwards every time the boat pitches and bobs in the water. The sliding hatch, during its lifetime is going to have to put up with a fair amount of abuse, from being slammed backwards and forwards and from being walked upon. Corners could be rebated but should be reinforced with a dowel, they will be stronger if made with finger joints or dovetails. The hatch covering will not only look better if curved but will be more able to withstand being walked on. The top can be laminated from layers of ply or if you prefer tongue and groove, just make sure the timber is not prone to too much expansion and contraction when wetted. 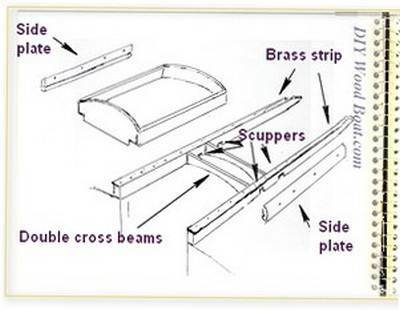 The side runners, frames and rails must be made parallel and not allowed to bend when fastened down. You also need to consider how the hatch is to be locked, both from the inside and outside. A simple sliding bolt will suffice to hold it closed from the inside. The form of locking you use on the outside is a matter of personal choice, my own preference if for something which will deter the opportunist thief but which will allow the determined burglar to get in without causing too much damage. For most wooden boat owners there is nothing to compare with receiving complements on the appearance of their boat, much better than complements about their partners. Much of the appearance of your boat will depend on the details. Details such as the style and shape of the hatches and those little finishing touches. A curved top will always look better than a flat one. And a sliding hatch which is higher towards the aft end looks more rakish and somehow more proper than one which slides level. Idlers walking along the dockside who look down on your deck will be impressed if your hatch has a smart hardwood trim and the rails are finished off with a birds-beak.